The new four-piston Hayes Dominion A4 is designed for trail, enduro, downhill, or even eBike use. 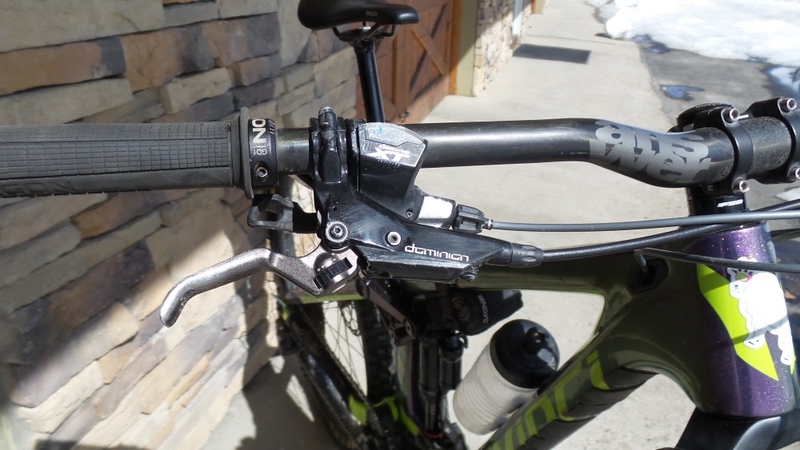 Editor’s Note: This test was conducted by Mtbr contributor Jeremy Kipp, an experienced bike shop mechanic, who’s also owner of lead guide for Ride Local, a mountain bike guiding outfit based in Crested Butte, Colorado. 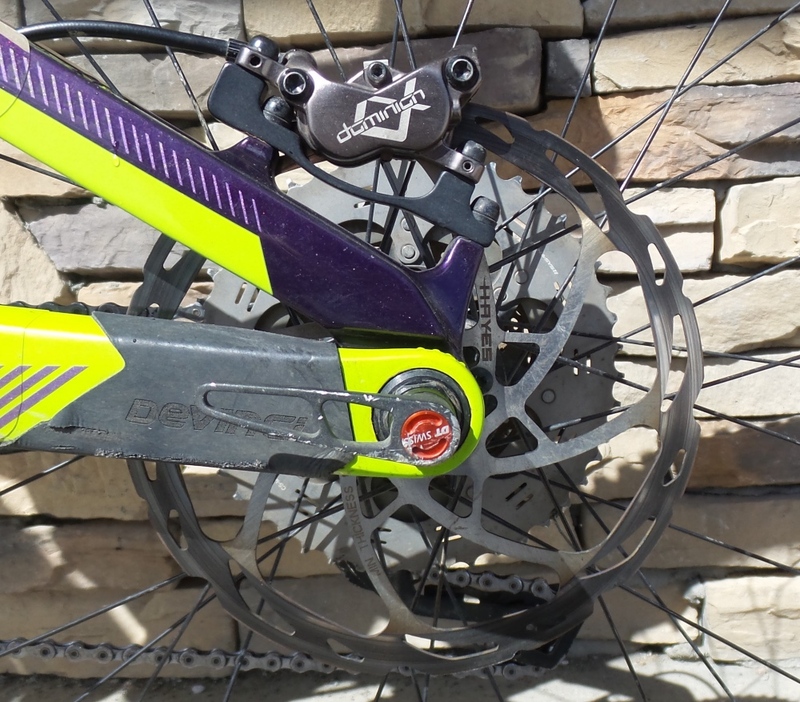 The Hayes Dominion A4 is an all-new four-piston brake system designed for trail, enduro, downhill, or eBike use. The Dominion’s master cylinder is factory tuned for the shortest dead stroke possible and a crisp bite point. 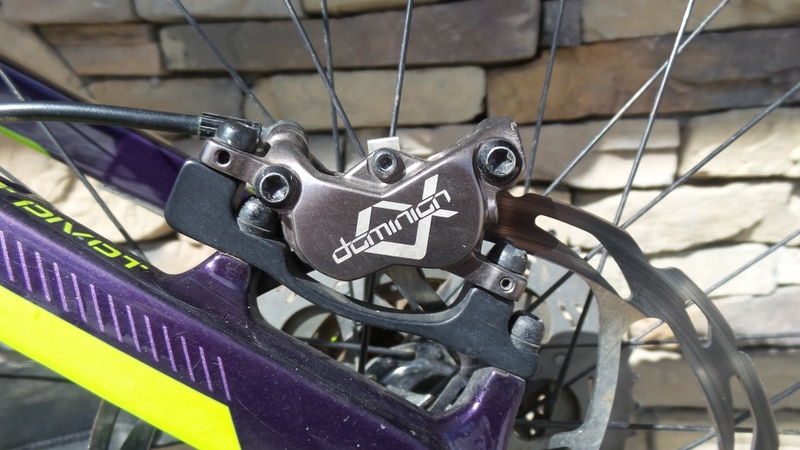 The Dominion A4 caliper utilizes four pistons in what Hayes calls a structurally rigid design. It also features cold-forged calipers and KingPin structural pad retention bolts that are aimed at increasing stiffness. The Hayes Dominion A4 brakes also have a motorsports-inspired two-stroke dual port bleed system, use DOT 5.1 fluid and Kevlar hoses, which all conspire to deliver reliable performance across a range of temperatures. Additionally, the Dominion A4 features a QuickBite system for fast and consistent burnish, coupled with their D-Series rotor designed to manage the heat with less braking noise. Claimed weight is 310g (90cm hose and mount hardware). Keep reading to find out how they fared in this Mtbr test. When I pulled these brakes out of the box, the first thing I noticed was how big they are. Running on DOT 5.1, the lever body has a large reservoir with new internals, and the lever itself can easily accommodate up to two-finger braking. The caliper is equally massive, dwarfing most other 4-piston brakes currently on the market. And even the brake pads look big, while the rotors are thicker than usual to combat heat build-up, and the brake line is thicker and stiffer to offer better performance and braking consistency. It all adds up to a brake system that means business. And at 1.5 lbs. 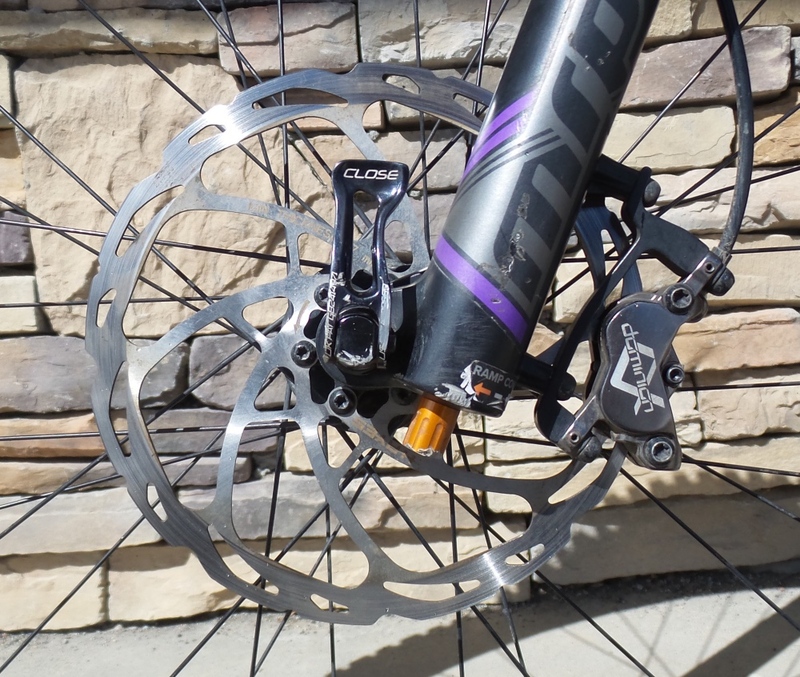 per brake (including rotor and hardware) this brake is right at home on a DH bike or long travel enduro rig. The levers have a great hand feel and are plenty big for 1- or 2-finger braking. In addition to its size, everything about the Hayes Dominion is new and completely redesigned. Lever internals sport some neat features to reduce friction and improve modulation. A glide ring, taken from the suspension realm, in the master cylinder with a bearing at the lever point lightens the lever modulation throughout its stroke and lessens dead stroke. Hayes also adjusted the lever pull ratio, which reduces internal pressure throughout the system. This coupled with stiffer brake lines means that it should ramp up smoother at the end of its stroke, delivering better performance under hard braking. The caliper, like mentioned above, is burly and could almost do double duty on a dirt bike. Two bleed ports at the caliper aim to improve the fluid passageways behind the pistons and help remove air in the bleeding process. New seals in the pistons reduce friction some more, while providing consistent pad contact when your brake pads start to wear. Another nifty feature Hayes added is a pair of grub screws near the mounting holes of the caliper that aid in centering your caliper. It’s an impressive overall package. 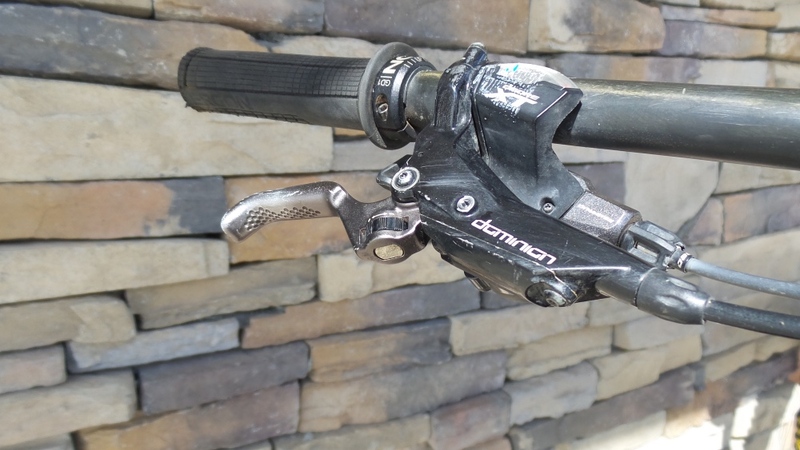 Mtbr pushed the Hayes Dominion A4 brakes hard during two months of testing in South America. Mounting these up to my Devinci Spartan (a 27.5 enduro rig with 165mm rear/170mm front travel) was no different than any other brake I’ve recently dealt with. But they did require a more thorough bleed compared to offerings from Shimano and TRP. Indeed, the full bleed process requires a few extra steps, but any experienced mechanic should be able to handle it. Once bled, aligning the caliper was a breeze thanks to the crosshair alignment screws in the caliper. 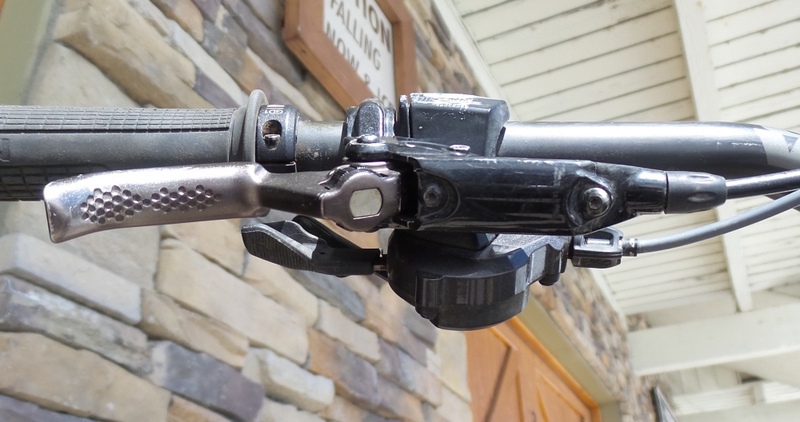 There were also no issues getting the lever position where I liked it, as it was compatible with my Wolf Tooth dropper post lever and Shimano shifter. These brakes come with two brake pad material options: a semi-metallic that they say offers better modulation and ramp up, and a sintered metallic that will last longer, but adds a bit more bite throughout the stroke. I started this test with the semi-metallics with a 200mm rotor up front and 180mm rotor in the back. Bedding in the pads took a bit longer compared to Shimano and SRAM, but overall the process is the same. It just took a few more laps to get them braking evenly. The majority of this test was conducted on the extreme terrain of Peru and Ecuador during a two-month mountain biking odyssey. The trails on the other side of the equator are comprised of long rocky technical descents on unmanicured hiking trails that usually start somewhere around 13,000-15,000 feet above sea level. I also did a handful of rides at my home base in Crested Butte, Colorado, where the terrain is more fast and flowy. Tool free reach adjust is a nice touch. Suffice to say these brakes got absolutely worked over during this test, especially in South America where I logged roughly 175,000 vertical feet of descending and over 400 miles on very rocky, steep trails at high elevation. It’s also worth noting that I’m 5-6 and about 180 pounds, grew up racing downhill, and now gravitate to very aggressive trail riding. Despite these harsh conditions, it’s clear that all the work Hayes put into reducing friction in this system has given this brake among the lightest and smoothest lever modulation I’ve ever used. It’s exceptionally light off the top with virtually no dead stroke in the beginning of the stroke. Overall modulation is on par with the TRP Quadiem and SRAM Codes, but the Dominions beat the competition under hard braking at the end of its stroke. DOT 5.1 fluid flows through the oversized master cylinder. For example, when braking at the last second before a corner, you feel the ramp up in the modulation and control the bite point much more effectively into the corner with the Hayes Dominion. On steep rocky switchbacks these brakes improved my nose pivot skills since I could feel the point of locking up the brake versus not locking it up. The lever modulation on this brake, is by far the best I’ve ridden. And even though the lever is large, I didn’t have issues with it cramping up the controls on the handlebars. Lever ergonomics fit my hand well, with a similar feel to the TRP Quadiems. 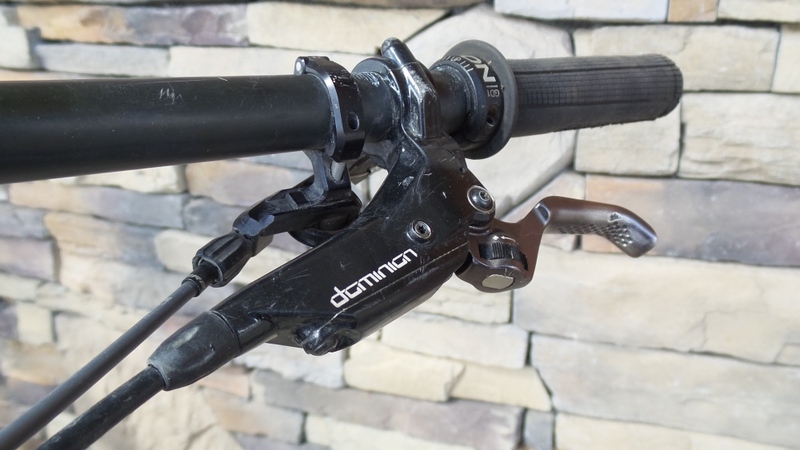 In the power department, the Hayes Dominions don’t have quite as much bite as Shimano Saints, but the excellent modulation makes up for that. Power is equivalent to the latest SRAM Code brakes, and a bit better the TRP Quadiems. However, during an entire summer of riding with the Quadiem, I never had to do any maintenance, which was not the case with the Dominions. The burly Hayes Dominion A4 caliper would be at home on a dirt bike. The first issue I had with these brakes was consistency of lever modulation. 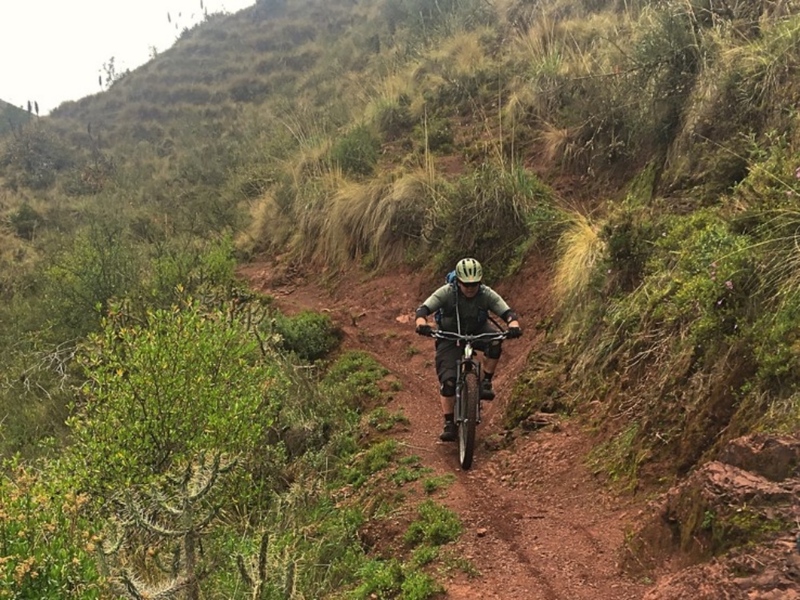 Perhaps it was due to the high elevation and steep rocky descents in Peru and Ecuador, or the huge vertical loss over a short span of riding, but after about 2-3 days the lever would pull closer to the bar. I found that resetting the pistons and re-aligning the caliper fixed this, but that fix would only last a couple days. Same goes for a bleed and new pads, which would return lever modulation to par, but then fade after 4-5 days of hard riding. Thus in the two months of testing these brakes, I bled them four times, and went through three sets of brake pads, front and rear. I also roached the 180mm rear rotor and ended up replacing it with a 200mm rotor. This all happened while using the sintered metallic pads, which Hayes claimed offered better modulation. We had to reset pistons and/or bleed system several times. The second issue with these brakes occurred on the 15th day of riding in Peru when I experienced rear brake failure where the lever pulled straight to the bar like a brake line had torn or the lever internals had blown. Fortunately, I was able to pump up the brake and avoided crashing. Upon further inspection, I found that one of the rear brake pads had completely de-laminated. The braking pad material was entirely gone and the back plate was completely smooth. Not surprisingly the rear rotor was damaged, which is why I bumped up to a 200mm rotor and switched to the sintered metallic compound in the rear brake. We loved the ergonomics of the Hayes Dominion A4 brakes. For the remainder of the test I did not have any more brake pad related issues, and continued with sintered metallic pads in the back and semi-metallic pads up front. I ended up liking the harder sintered metallic brake pad compound, as lever pull was more consistent and it added some extra power. Overall, I really liked these brakes. They have a burly build, and when working were awesome, with excellent modulation that gives you an incredible amount of control. They were also a good match for my Devinci Spartan and for the trails I was riding. I also appreciated the extra features such as the thicker rotors, bigger pads, and stiffer hoses which makes for a robust brake system. 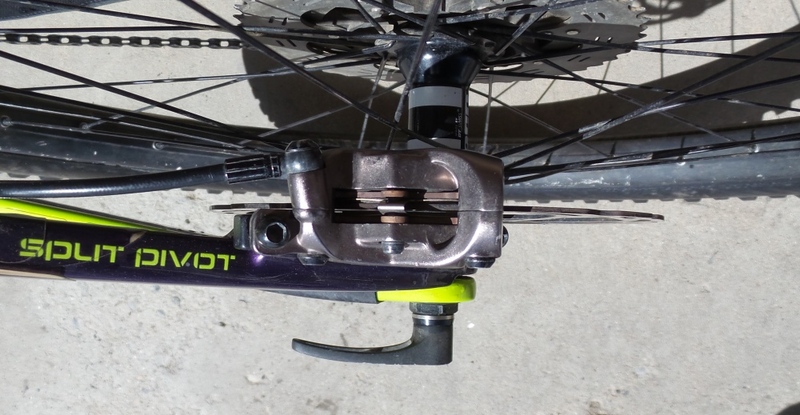 If only the lever modulation was more consistent, this brake would score top marks. Unfortunately, they needed a bit of weekly maintenance to stay up to par for the terrain I was riding. Two bleed ports at the caliper aim to improve the fluid passageways behind the pistons and help remove air in the bleeding process. 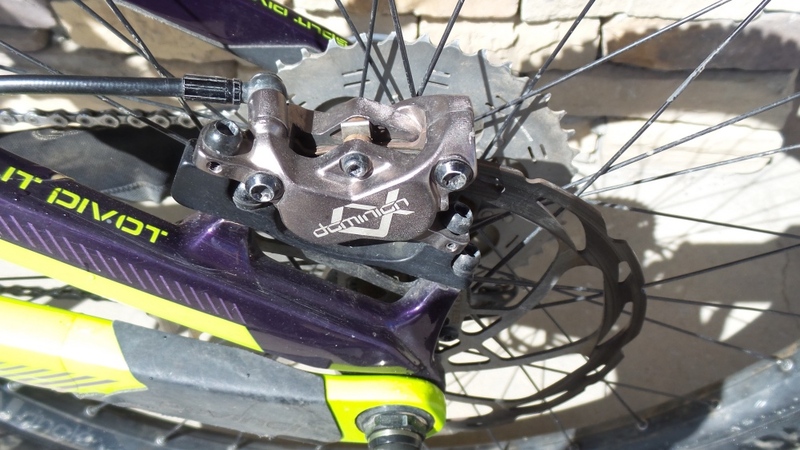 Mtbr pushed the Hayes Dominion A4 brakes hard during two months of riding in South America.